Rooms and toilets were kept clean - the areas around the bars and pools was fairly bad. The staff cleaned these areas as and when they felt like it i.e. hardly ever. Sparrows are allowed to fly where they please in the pizzeria where food is served. Awful. Both my wife and I still has stomach problems. Upon leaving the hotel and boarding the coach, lots of other people came forward saying they were ill too. Everything chilled could not be eaten, as it was allowed to be covered in flies. The food served 'hot' is lukewarm and under-cooked. Everything is bland - don't go expecting any kind of spice to the food! As stated above, birds are given free-reign to eat any remaining food left on plates the waiters cannot be bothered to collect. They appear to have nests in the top of the pizzeria and I can only imagine the diseases people have picked up from there because of this. Oh and the 'Chinese' restaurant? "we don't have noodles, so we use spaghetti"
Actually pretty good. Fairly close to the beach and nice and close to shops and (more importantly) restaurants, where to can actually experience some pretty decent food. A very mixed bunch. All-inclusive holidays generally breed contempt in staff, as they are not working towards recognition of any kind (and therefore a tip), and this hotel exemplifies this. Some staff were incredibly lazy - simply going through the motions of 'service' - some were downright rude. There were a few exceptions - the room cleaners were hard working and friendly and some of the restaurant staff showed a little more enthusiasm than others. If it has not been for the enthusiasm one group of dancers had given on one of our evenings there, this would have been a '1' also. There simply was no entertainment at all throughout the day. Night-time entertainment was incredibly formulaic and most nights non-existent. PLEASE do you and your stomachs a favour and do NOT stay at this hotel - it sullies the name of Cuba and will leave wondering why you even bothered with that 10-hour flight. Hotel good and staff warm and helpful, the Cuban cuisine is rather bland and tasteless but non the less edible. The pools were of a good size and quite clean. Drinks are standard but enjoyable in the heat. the thunder storms are just awesome and were quite frequent but mainly mid to late evening.Trips to go on should you wish to see the REAL Cuba are the overnightin Havana, This place really benefits from the lack of American commercialism it would ruin its charm and feel. Overall a good holiday destination that you must see in your lifetime. I emailed the hotel before we went requesting a specific room. They did not reply to me email until I contacted them for the fourth time when they said they would try to accommodate us but could not give any guarantee. When we arrived we found ourselves in a room far away from the one we requested ,which had been allocated to someone else on the same day that we arrived, so obviously no intention of trying to accommodate us. We asked, after one day, to change rooms but they said none were available and to check back after a few days however there was someone asking to change their room located in the area that we wanted and they were complaining because of all the noise that went on all day around the pool which was located near to the room so we did not bother. ROOM: Our room was basic but clean except for the blankets in the wardrobe which looked mankey so we did not use them, we used our towels and coats when we were cold. There was no fridge and no sun at any time of the day. The room was facing the road which was quite noisy. The cleaning of the room was very good and when I asked for a faulty bulb to be replaced it was done the same day. The noise level In this hotel is also terrible. The corridors are very echoey and unfortunately most residents are not considerate when coming & going to their rooms. The shouting and whooping in the corridors and slamming of doors was constant, especially when the disco shut at 4-5am or when people were leaving in the middle of the night, they would bump their suitcases on wheels down 4 flights of stairs! Someone we spoke to had a really bad smell from the drain in their room which came and went during the holiday, they also suffered a lot with no hot water, a problem which we never had. we stayed at palma real for 14 nights and we had a fantastic holiday. the staff were really friendly and couldn't do enough for us. we are quite fussy eaters and the food was relly nice, i read before we went that cuban food was quite bland so we was pleasantly surprised to find it really tasty. We are already lookijng at going back next year and taking family with us. 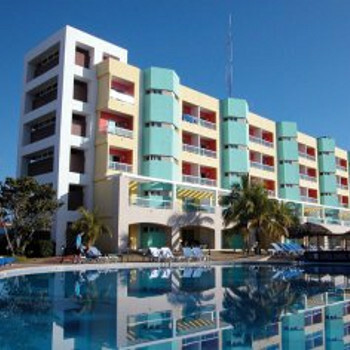 i would recommend this hotel for a wonderful holiday in cuba. the location was perfect we did see some of the other bigger more expensive hotels but they were so far out of town, we had every thing we needed close by including a pharmacy as i ran out of nappies. Upon arrival to the Palma Real we had mixed feelings having read reviews on line. We like to keep an open view and arent really that hard to please. The food for an all inclusive was shocking: very little variety and the produce was not fresh. We stuck the hotel out for 4 gruelling days before we paid extra to transfer to another hotel. When we complained to our rep he had the cheek to say that as it was out of season they had a lower food budget! we couldnt believe what we were hearing. You would expect that if you ordered a pizza you would get at least some tomato paste on it - well not at Palma Real!! The rooms were ok I suppose but when you've paid for all inc and have to go out to local restaurants every day and night you do feel a little ripped off! The only good thing taht came from the holiday was our switch to Sol Palmeras a little way up the road- a completely amazing stay there and we couldnt fault a thing!!! First ever visit to Cuba and I loved it. There have been good and bad reviews of this resort, but I found it fine. Ok, food is a little to be desired, but if you bear in mind that the local people are living on rations, it may change your mind. I was quite shocked when I read reports of the staff being rude - quite the opposite in my experience, but I made the effort to learn (very!) basic Spanish. We visited this hotel on our 4th visit to Cuba. We thought Varadero would be an exciting vibrant place to be......very disappointed on that score. WShen we arrived at the hotel we were not greeted by anybody and had to find our own way. Nobody helped us with luggage. We had to request some assistance from a porter who took his time in coming but was very helpful when he did arrive. It took 3 attempts to get us in a room that was half way suitable, but we were then over looking the hotel rubbish dump. We asked for a room change which we got 4 days later...over looking the pool, very nice. The hotel was cleaned regularly and the room maid was very attentive. The hotel has no laundry facility, don't ask the maid for service as we didn't get our clothes back until the day before we were due to leave. The food was not good, buffet had very little in the way of food for children. My son lived on bread and chips for 2 weeks. The pizza place was ok, but service extremely slow. It took one hour to get our pizza!! We ate out a lot. Local resteraunts were quite good and very friendly. The reception staff at the hotel were the most friendly of all, almost every body else was sour and were looking for tips or for you to leave something for them when you left. Entertainment was practically non exsistant!!! The outside theatre was under construction and so any entertainment was held in the lobby... very noisy, not enough seating, and impossible to get near the bar for a drink.. again we went out most evenings to a local bar Calle 67, great entertainment, fun place to be, but kind of defeated the all inclusive package! There were no daytime activities that I spotted,apart from one aerobics class in the pool. The beach is not too far away, but it is not on your doorstep, you have to cross busy roads to ge there. The beach bar is set too far away from the beach, but the beach was lovely, plenty of sunbeds, and clean. We would never visit this hotel again ever! Hi! We stayed at the Palma Real over Christmas, the hotel cleanliness overall was good there was never litter ant the hotel rooms were always very well cleaned! The food at the hotel was bad we rarely found something we liked, and resorted to eating out! The pizza place was quite good though, but the main buffet restaraunt didn't serve basic meals like chips or burgers they had things like squid, and a lot of Cuban food which meant brit's would find them selves not liking but it is to some peoples taste. The hotel location is great very close to a fantastic white sandy beach. It is also only a short walk away from local shops and markets! The hotel staff were lazy (bar the cleaners who were very hard working) they sat round most of the day talking amongst each other. The entertainment at this hotel is non existent!! Throughout the day there was suposed to be vollyball, spanish lessons etc of which none took place. The nightly shows were simular every night and they weren't very good! (if you have already booked this hotel take a c.d player as they never play any music in the nights,its dead quiet). I would never re-visit this hotel but you couldnt fault the surrounding area. My partner and I have stayed here twice so far and have loved it! The site was very cleanly kept, the pool bar had friendly staff, inside bar staff were abit more "serious" but still friendly. a stones throw away from the beach and local markets and shops. There is a bar/ restaurant called Al Capones just a horse carriage or Co Co cab ride away and that is also a fantastice place with the beach on its patio. The hotel food I found was ok but not much on offer for the basic palet.. i.e we British.. I found pasta and bread rolls became my main meal. Although there was a big selection of food for the more adventurous tastes. The pizza place was a favourite too, the chinese reastuarant left a lot to be desired though. Not much choice and very little on the plate and only one visit per person per stay!. We would recommend this hotel. The entertainment was quite good if not a little loud when in the bar area when the dancers were banging the drums, but on the whole good Cuban entertaiment. We visited a lagoon to swim with the dolphins which was absolutely fantastic! Havana was a great place to visit for the history and cultural minded. We will be visiting again with out a doubt, we have made many friends and thanks to the staff we had a great time. The beach was great, long sandy, stretching as far as the eye could see. On our first visit to the beach the first thing I saw were dolphins in the surf, only saw them once more but it was a great site. The sea was great for swimming and playing, all sand and no sharp rocks. The food was Ok, a little bland but there was a pasta/pizza place aswell that you could rely on if the food was boring at dinner, all was inclusive. Entertainment was fantastic, the dancers at the hotel were as good as the ones we saw at the Tropicana. The actual hotel is fine, a few pools, a few bars, it is quite big. Nice beach bar with a snack bar there. Good shopping nearby with shops and a large open air market. The Havana and plantation trip was great.